A wood boiler stove is an appliance that can burn wood to create hot water. Some take the form of what you would recognise as a traditional woodburner whilst others look and work much more like a gas boiler. There are various types and permutations of boiler for wood stoves available but they all do the same job - they transfer heat from the burning wood into water, which can then be piped where it is needed and used for heating or domestic hot water. In a traditional wood boiler stove the boiler is usually a simple metal box filled with water and with 2 or 4 tappings to allow you to attach your water pipes to it. These tappings are usually 1" BSP fittings. Usually these boilers replace the firebricks inside the firebox of the stove and are known as backboilers because the bulk of the boiler is at the back of the firebox. Wood boiler stoves can come with a variety of rated boiler outputs from around 5,000 BTU to 90,000 BTU. Make sure to check whether the rated output is the maximum or nominal. The nominal output is the output at which the stove would normally be run and is of course lower than the maximum output. You would not drive a car at it's full speed all the time and a wood boiler stove is just the same. Also when sizing the boiler stove for your needs remember that you need to use the nominal heat output. 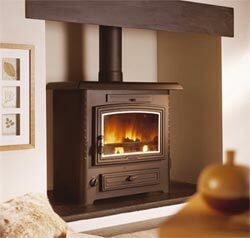 A boiler stove can be used to power your central heating system and to provide hot water as well. Designing such a heating and hot water system is relatively simple but you will need the help and advice of an experienced heating engineer. Here the wood boiler stove is connected to the house heating system, commonly radiators, and the heat from the burning wood is pumped around the house. If your house uses underfloor heating then you would connect your boiler stove to a hot water tank and then the underfloor heating would be connected to that. One of the differences between a boiler stove and a conventional gas/oil boiler is that it takes time for the hot water coming from the stove boiler to get up to temperature. This means that you cannot simply take hot water directly from the stove boiler: you need to connect the boiler stove to a hot water tank. The water in the tank is heated by the stove and stored up for use when needed.